I really hope you all can make this adoption event! To celebrate 10 years, we will have the amazing band, Camp Fire Soul performing and several PugHearts supportive vendors to shop at! There will also be food trucks and alcoholic beverages sold through Toddy Blends Winery and Distillery to get the party going. Of course the pug pen will be in full swing with adoptable dogs looking for a good home. PLEASE NOTE: this event will have street parking only. Please be very aware of your surroundings while walking to the event from your car, especially if you have dogs or young children. We have so many new fosters and volunteers and we would like to get both new and old together for an informational meeting. This is a PEOPLE ONLY event. The purpose will be to review our foster and volunteer programs and answer whatever questions you have. We also hope to have helpful products that many of our experienced fosters use available for purchase or loan. The meeting will take place at the "club house" (2900 Manvel Road Pearland, TX on Sunday 1/19/2014 from 2pm until 4pm. I hope you all can make it out because it will be a great place for everyone to exchange knowledge. Tonight I, Popsee (aka Pauly D – the spray-tanned pug) visited a pet store for the first time. I’ve been settling in nicely to my new foster home with two very accommodating foster sisters, or better known to many PugHearts volunteers as the pug imposters (below). I had a wonderful time visiting my favorite garden earlier this evening, the one from my first adventure mentioned earlier in the blog when the nice lady came and picked me up from that place I was staying. I wanted to bring home some gifts to my foster sisters to thank them for letting me stay with them and asked my foster human to take me to get some rawhide chewies. Aren’t I a sweet thoughtful boy? The pet store was full of so many good smelling things I just didn’t know what to sniff first! There were lots of people to lick and other dogs to say hi to. I was sure to meet everyone with a huge smile and as always, lots of kisses. I even impressed a lady so much on the way out who smelled like all the best things who liked me so much she said she’d seriously considering filling out an adoption application for me. My foster gave her a card and told her to go to the awesome PugHearts Web site, www.pughearts.com, to do so. I hope she does because I’d have a real brother of my own and a daddy with a really cool accent. My foster takes me out on lots of walks and is trying to teach me to heal. It’s hard work because there are so many things to smell and see in my new neighborhood I just want to run everywhere. I’m fast and love to run around. I’ve got lots of energy to burn so I’m trying to be good but sometimes you just gotta be a puppy, know what I mean? I've met lots of humans and they are all so nice and like me so much. My foster makes sure to tell them I'm looking for a forever home and a lot of them seem really interested. Paws crossed!! Well it’s about time for me to take my foster human for her last walk of the night. My foster sisters loved their chewies and we all had yummy treats tonight. I’m tuckered out so I need to go so I can get my human to bed. She has to get up early for our walk in the morning. It’s hard to train a human sometimes, but I’m working on that too! I’ll be out at Natural Pawz in the Tanglewood/Galleria location on Saturday. Come out and say hi. I’d love to meet each and every one of you. I promise to save you some kisses. Maybe I’ll even chose you as my forever home. I’d love to have a place to call my own where I can run and jump, love on little and big humans alike, maybe even have a brother or sister like me. There have been a few questions from members wanting clarification of what’s going on with PugHearts’ online presence. What’s going on with our website? What’s the Facebook group for? Are we on Twitter? What’s up with Petfinder? Hopefully we can get some information out there to get everyone up to speed on our changes. Our website is not going anywhere! We are extremely proud of the polished, professional site that we have to showcase our rescues. In addition to the OurDogs page which features all the dogs, our website is a wealth of information on PugHearts and all things Pug! We have information about the breed itself. We have educational pages that explain why you should adopt a rescue instead of buying a puppy from a breeder. We have information about who we are, how we got started and our mission to save every pug we can. We have detailed information about way to give, our non-profit status and contact details. We have great stories from our fosters and other volunteers. And of course we have lots of details about how to adopt. We do list some of our dogs on Petfinder. In the descriptions for the dogs we list, we give details about PugHearts and how to adopt from us. Each listing refers the reader to our website to complete our online adoption application. We do not accept adoption applications or queries in any other format except our adoption application. We use Petfinder to help people find us who do not know we exist. Often times, people looking for a breeder will stumble onto us through this site, as they weren’t looking for a rescue in their search. 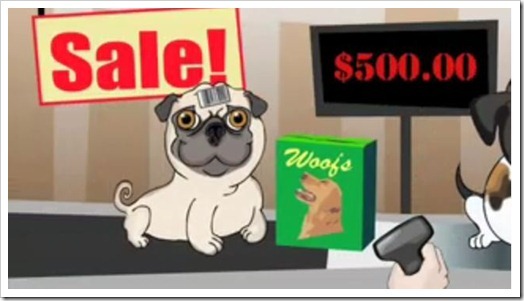 It gives us a chance to let them know about the beautiful Pugs we have and help teach them that buying from a breeder perpetuates the cycle of over-breeding and creates more unwanted cast-offs that end up in rescue. Due to the listing software being rather awkward to use, we do not list every dog we have through their website. However, we will continue to keep a presence on Petfinder so that we can get the word out about pug rescue in Houston. As Facebook is such a popular venue, we knew we had to have a presence on there. After careful consideration, we decided to open a Facebook Group rather than a Fanpage. We wanted a dynamic, interactive place for our supporters to find ways to get involved with our Rescue. A Fanpage only allows a person to “Like” it and then do nothing. But a Group keeps everyone involved! So now, for those of you who want to commit to be an active supporter, you can join our Group. We update Group members on events and can even keep track of who’s attending via the Invitations. We really want everyone who signs up for our Group to be an active participant, not someone who just adds us to their Friends. Remember, this is not a Fanpage; this is your chance to stand up and be counted as an active supporter of PugHearts in a way that our website doesn’t allow. If you make the commitment to join our Group, we want you to roll up your sleeves, dive in and make an impact! This is your chance to post comments, share our pages and help get the word out about our adoptions and fundraising! Let everyone know you’ve donated, fostered or helped in some other way – have your moment in the spotlight! If that’s too much of a commitment for you right now or you’re not ready to be actively involved, then please continue to visit our website for updates and information. For those of you who are committing to actively participate: welcome to our Group! Yes, we are on Twitter too! We’ve had the account for a while, but have only posted sporadically. Until now! We now have our volunteer Whitney doing a fantastic job of getting us active with this newest social network venture. And as we gain more of a presence on Twitter, we are hoping more of you join up and Follow us. Twitter is the perfect venue to give quick updates on new rescues and happenings, with links back to our website for details. So as you see, our website remains our primary online resource. All of our other online venues will always link back to www.Pughearts.com for the heart of our endeavor – adoptions. These other forums offer ways for you to get involved that the website doesn’t offer, but when you’re ready to find the newest member of your family you know exactly where to come! 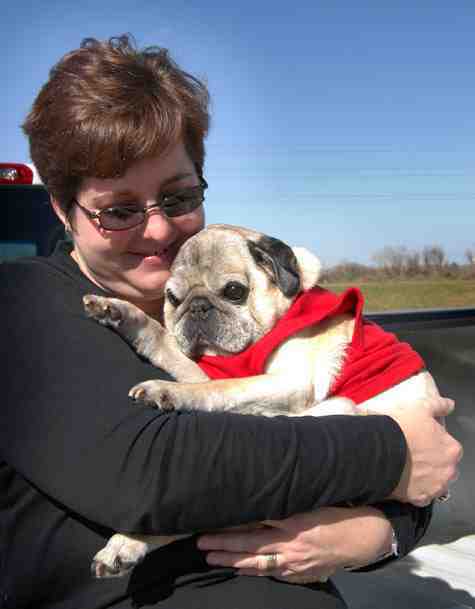 Before Cindy dreamt up the idea of PugHearts, she was a foster for another non-local rescue group. She already had a very good idea of what it took to run a rescue and what kind of needs she would encounter. As she set up PugHearts, she called on people around her that understood those very special needs. Some had already fostered for other groups, some had adopted rescues. But all of us had that “whatever is best for the dogs” attitude. We all agreed that we wanted an organization that would treat the rescues just as they did their own dogs. We did not want to open a shelter where our dogs lived in cages until they were adopted out. We wanted to allow these rescues to live in a safe, nurturing home environment until their forever home was found. We also insisted that we would not adopt out any dog to a home that we would not feel comfortable placing our own pets in. And so, PugHearts was born! We’ve gone from a very small group of people that could all fit in Cindy’s living room (with our dogs running around, of course) to a vast network of people spread throughout the Houston area. Our commitment to our dogs has remained. We now have around 100 dogs in foster care. That takes a lot of people giving a lot of time and energy to these furbabies. And we appreciate it more than we can possibly express. But I’m going to take a moment to let everyone know what’s involved and just how much these volunteers contribute! Unlike a lot of organizations, PugHearts takes a very “hands-on” approach to selecting both foster and adoptive homes. In fact, we require the same standards for a foster home that we would an adoptive home. It makes sense, as we want these dogs in the best environment possible during their stay with us. So, a home visit is mandatory before approving a foster home. We want to see the environment these guys will be living in during their fostering. We aren’t worried about dust bunnies or décor; we want to know the environment is safe and secure. If there is a backyard, is it fenced? Are there other animals or children in the house and if so, how will they react to an “outsider” in their home? Does the potential foster parent treat their animals as we want our rescues treated? As a lot of our dogs come in to us abused or neglected, we also have to be sure they are going to a nurturing environment. Some of these dogs have never had a person show them affection. Many have never lived inside a house before. These are significant challenges that our fosters work to overcome. They teach these babies that it’s okay to trust humans, that they need to go outside to use the bathroom, they don’t have to “defend” their bowl against another dog eating near them. They teach them socialization. They teach them about love. And that can take a lot of patience. All of our fosters are responsible for seeing that any dog they have gets the necessary medical care. Usually that consists of taking them in for check-ups, maintaining their Heartguard and Frontline administration and any after-care from spay/neutering or routine dentals. Many of our fosters also administer daily eye drops or ear medications and see that follow-up visits with our vet are kept. Some do much more, as some of our rescues have significant medical issues. Unfortunately, we get a lot of dogs that are heartworm positive, so we need fosters who can care for these babies as they undergo treatment. We also get dogs in with severe injuries that require intensive care. We get the occasional hospice dog that needs a special home to live out their final days. And of course, you never know when an unforeseen emergency will happen. Our fosters need to be able to get our rescues to our vet in the event of an emergency, even if that means 11pm on a Sunday night. We have an amazing group of foster parents who look after these furbabies as though they are their own and help get them in the best health they can, so they can go to their forever homes. We have a fantastic website that allows people to look at a dog’s photo and biography to determine what dog might be a good fit for them. Those photos and bios usually come directly from the foster themselves. They take the photos you see. They write up a bit about the dog they are fostering, ‘cos who knows them better? They tell us, and potential adopters, what kind of home would be best for their rescue. 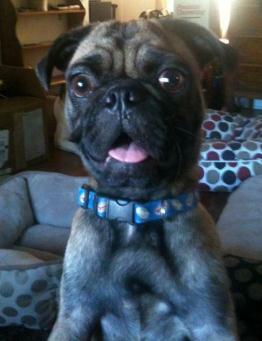 One of the big differences with PugHearts is how we screen our potential adopters. In addition to the adoption application with reference checks, we also want to see how our rescue will fit into that new home. So not only do we conduct a home visit to see the environment, we take the potential adoptee around to meet the members of the family and get a feel for how they will do in that home. We call it a “Meet & Greet.” Most often, the foster parent takes the dog themselves. We feel that since nobody knows that dog better, they are the best judge of how it fits into that home. Sometimes another volunteer does the actual home visit and the foster instead meets the family someplace else for the Meet & Greet. Either way, the foster has taken time out of their schedule to try and find the right home for their rescue. We have a lot of people that are looking to adopt a dog, but they can’t quite narrow it down to just one to meet. Sometimes we schedule multiple home visits, but sometimes it’s a lot easier to tell that person to come to an adoption event where they can meet multiple dogs. So, we ask our fosters to bring their dogs to these events throughout the Houston area. That means our volunteers are giving up their Saturdays, or evenings, or sometimes entire weekends (like the Reliant Dog show) to try and find a forever home for their rescue. We cannot begin to thank them enough for giving up so much of their time. So, as you can see, our fosters are pretty special people. They give up a lot to help us help these furbabies. It’s a lot more than just putting a roof over their heads. It’s time, patience, heart and soul. It can be sleepless nights, tears, stress and yet it can be the most fulfilling and rewarding feeling ever. We are eternally grateful for all they do. Somehow it doesn’t seem enough just to say it, but Thank You! I also need to take a moment to clarify what fostering actually means. When you foster a rescue, you are agreeing to provide a temporary home for a dog until we can find a permanent adoptive home for it. Fostering is NOT a “test drive” to see if you want to adopt a dog. When you agree to foster, you do so with the understanding that the dog belongs to PugHearts and we are trying to find it a permanent home. We require the foster to play an active role in finding a forever home for that dog so that includes bringing the dog to adoption events and Meet & Greets. We also require the foster to be able to get their rescue to and from the vet as needed. We pay for the medical care, but we need our volunteers to be an active participant in the dog’s medical treatment. We do not pay for food, treats or toys – though whenever we receive donations of these items we will gladly pass them onto our fosters. Obviously, we cannot pay our volunteers for what they do for these little guys. But I can assure you that you will get back far more than you put in with these furbabies. Their unconditional love and the feeling of satisfaction you will get cannot be measured. For those of you who are reading this and think you’d like to help, we encourage you to get in touch with us to discuss fostering. We would love to have you help! We do ask that you be sure you are able to fulfill the commitments we require. If you have the time, space and love to give, please fill in our Contact form and select “Fostering” to let us know you’re interested. Or ask us in person next time you see us at a local event! We are changing the way we bring you updates. From this point on Facebook will be the location to find information on Events and day to day happenings at PugHearts. We ask that you take the time to join us on Facebook and ensure you are kept up to date. The PugHearts website will continue to be the place to check on available dogs, successful adoptions and the very sad Rainbow bridge. We will also post more details information on events within the Blog, and donations and event ticket sales will also be handled here. The move to Facebook Groups opens up PugHearts as community to one and all, a hub that will enable instant updates via the web, email and your phone. Its a move to the 21st century. Please join us. Remember, if you do not want to join Facebook, then you will still see major updates within this Blog. It is our birthday, again! It is amazing to me that we are having another birthday. Today PugHearts is 4 years old. I have been thinking about this birthday a lot lately. Looking back at where we have come and what we have been able to accomplish. There are so many stories and so many pugs that have benefitted from our being here. PugHearts has rescued more than 700 pugs in the 4 years that we have been working so hard for the pugs in our community. Let me remind everyone how we got here. I fostered for another group and was the foster to a special old man named Charlie Brown. I named him Charlie because I wanted him to know it was going to be a good life from that time forward. He was the worst first night I ever had with a new foster. Charlie screamed for 9 hours straight. It did not matter what I did. I held him. I crated him. I put him with my pugs. I put him in the bed with me. Nothing worked. He was scared, sick and the only thing he could do was scream. I cried. Charlie was with me for almost 9 months. Then the hardest day came. Charlie had a family that wanted to adopt him. I was crushed. I met the couple that wanted to love him. They were (and are) great. They had a pug named Charlie already. Charlie Brown became Alfie. I called 3 months after he was adopted to see how he was doing. Richard and Robbi were great and offered to let me see him anytime. I jumped at the chance and met Richard in the park that day. Alfie's paws never touched the ground that afternoon. I was thrilled and over the moon to hold him and see him looking so great. This photo was taken in January 2007. Richard and Robbi became board members. Richard is our webmaster. PugHearts went "live" on the web Valentine's Day 2007. We took in 3 pugs that day. I thank each one of you that helped us, supported us and allowed us to have the success that we have achieved today. Happy Birthday to PugHearts and Thank You for travelling with us on this journey. Just imagine where we will be in another 4 years. We are not going anywhere. The pugs need us. We need you. As many of you have noticed, we added a new page to the website. The Rainbow Bridge page allows us to be reminded of those that we have lost. This page has had a fair amount of discussion around it. We know that loss is a part of rescue and we cannot win all of the battles we take on. We also know that it is so hard to look at these faces and remember the love we feel for each of them. I was one of the ones that was not sure that we should put it out there. I do not like to lose. It is hard and I take many of these personally. We cry for each one that crosses the bridge. We try to figure out what happened and what we could (and can, in the future) do differently. Each pug in our care teaches us something. We try to hang on to those lessons. Sometimes, all we can see is the loss. The last few weeks have added several new names to the Rainbow Bridge page. Lilly_2 was an older lady in our care. She developed an intra-nasal tumor. This tumor eventually caused her to really struggle to breathe. We held her as she crossed the bridge to health and vitality. Avery was my "perfectly adoptable beautiful 6 year old girl". She was happy, active and loved life. One day her neck swelled up...this was the beginning of the end. Avery was diagnosed with lymphoma and the condition grew worse quickly. The swelling became increasingly worse in her neck and began effecting her breathing. We released Avery 10 days after Lilly crossed the bridge. This is what makes rescue hard. Avery and Lilly were both fosters in my home. Now, we add BeBe's babies to the list of those lost. Last Wednesday night, our BeBe went into labor. We were thrilled when she delivered 7 babies early in the morning hours of Thursday. We all cried when we lost the first puppy immediately. 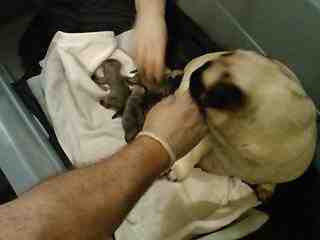 The others were so small, cute and squirming (as puppies should be). Sadly, they did not thrive and by today, we have lost all the puppies. This is one of the hardest things to explain and even worse to go through. We are all devastated. I am including a photo of the happy moment after delivery. This is what we must remember. So, why did I change my mind about the Rainbow Bridge page? We need to remember the sadness, the love, the journey and the loss. It is all a part of rescue. It is not possible to get one aspect without dealing with the other. I would not trade one moment with any one of the fosters listed on ANY page of this website. I have loved each of them, for different reasons and at different times. I had a volunteer say to me: "We need a memorial page. The available pugs are listed. The adopted pugs are listed, but the lost pugs are just gone. I cannot see his face. He is no where." Well, they were a part of us and we need to remember them. So please, take a look at our Rainbow Bridge page. Remember that we commit to all of these pugs, whether we win or not. Please consider donating so that we can continue to help all these pugs, not just the ones that we can save, but the hospice, hopeless and helpless as well. During the weeks before Christmas, more puppies are bought from pet stores than any other time of year—meanwhile, animal shelters are overcrowded with wonderful pets just waiting for loving homes. And the puppies in these stores almost invariably come from high-production facilities and puppy mills. Puppy mills look forward to this all year long, but this year, lets educate consumers about puppy mills so they choose shelter pets instead of buying puppies in pet stores. As Thanksgiving is fast approaching (loosen that belt buckle! ), it is a great time to sit back, take time to reflect on the past year, especially for the people you are most thankful to have in your life. Always included in my list each year are my friends at PugHearts. My life was forever changed after adopting Lou & Andy in August 2007 (and subsequently Flip in April 2009) and as my relationship with PugHearts has developed from adopter to volunteer, my appreciation for this organization continues to grow. A day doesn't go by that I don't think of all the lives that have been saved and changed for the better due to the generosity and selflessness of all the PugHearts volunteers. Sure, I help with the fundraising and blogging (although I have admittedly slacked a little on that), but that doesn't compare to the people who are out there every day rescuing, transporting, and nursing these poor babies back to health. In 3 1/2 very short years, we are quickly approaching 700 dogs whose lives have forever been changed for the better. While it sickens me to think that there is such a need for just ONE breed in ONE city alone, I am still so thankful that those 650+ have been provided a new and better life. From the bottom of my heart, a huge THANK YOU to all the PugHearts volunteers who work so hard to achieve the PugHearts goal: To never turn down any pug, at any age, in any condition.